I THINK YOU ALL LOVE THE SUPER CHARMING JOHNNY. AND THIS IS A FACT. I THINK YOU WILL AGREE IF I SAY THAT BESIDES THIS FACT, WE MUST ADMIT HE HAS VERY GOOD TASTE IN WOMEN. 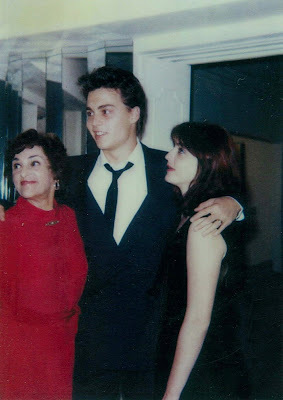 THE FIRST AND ONLY WIFE WAS THE MAKE UP ARTIST LORI ANNE ALLISON (WHEN THEY GOT MARRIED DEPP WAS A TELEMARKETER FOR INK PENS... OH YESSS). BUT HEIGH-HO IT LASTED JUST TWO YEARS. POOR LORI. 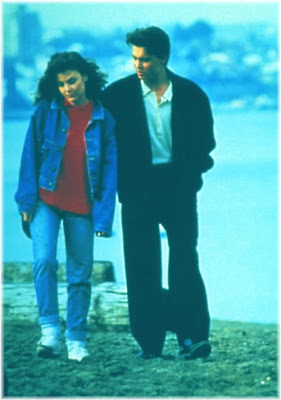 BUT HE GOT OVER IT VEEERY SOON AND STARTED DATING SHERILYN FENN (MET ON THE SET OF THE FILM "DUMMIES"). 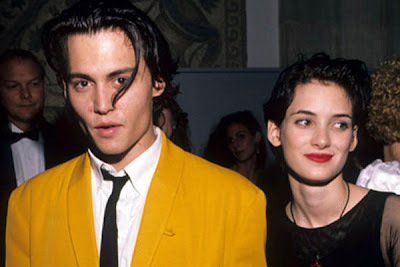 IN 1990 WAS THE TURN OF THE DIVINE WINONA RYDER. I REALLY TOTALLY ADORE HER. THEY WERE PERFECT TOGETHER. THEN JOHNNY AND WINO (HAVE YOU SEEN THE TATTOO ON HIS ARM?) TOOK THEIR OWN PATH... AND HE HAD TO CHOOSE A WORTHY SUBSTITUTE. AND WHO BETTER THAN KATE MOSS, IN THE 90'S? BUT I REALLY CANNOT UNDERSTAND HOW AND WHY HE CHOSE, IN THE END, VANESSA PARADIS. I MEAN... REALLY? SHE IS SUCH AN INSIGNIFICANT WOMAN. I don't think she is so insignificant-she has an intereting look about her. she reminds me of Lara Stone, or Lara Stone remind me of her! I WANT TO DYE MY HAIR SO BAD!